Larger tracks on the circuit like Atlanta Motor Speedway will see additional changes; when the series returns to the 1.54-mile oval in 2019, the Monster Energy Cup Series cars will use a modified tapered spacer that the sanctioning body says will deliver an estimated 550 horsepower. 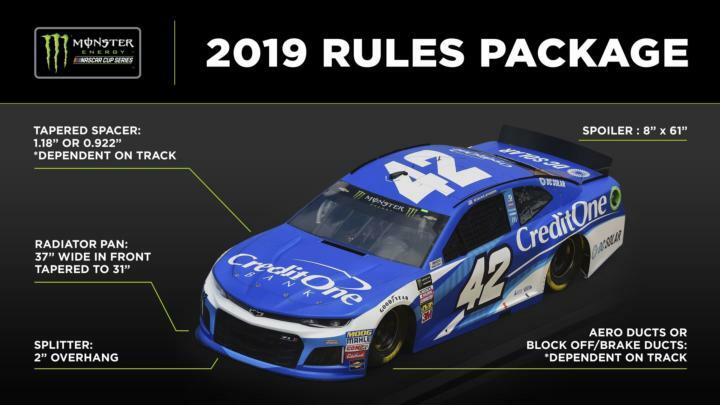 The February 24, 2019, Folds of Honor QuikTrip 500 — the second race of the 2019 NASCAR season — will be the first time this exciting new racing package will be put to the test. "Fans who love intense, close racing action have a real treat in store at the Folds of Honor QuikTrip 500," Atlanta Motor Speedway President Ed Clark said. "With 40 of the nation's best drivers competing with this new rules package, we should see an unprecedented level of racing drama at Atlanta Motor Speedway." The new specs are inspired by an experimental racing package that was used during NASCAR's 2018 All-Star race at Charlotte Motor Speedway. That race featured thrilling three-wide passes and close quarters racing from the lead car to the rear of the field.